My mother-in-law says that every family has a winter that they’ll always remember because of illness, hardship, whatever. I sure hope this is ours! Both kids are on antibiotics as we continue to try to kick this nasty sinus infection to the curb. This is Little’s third round of antibiotics since Christmas. And, although this is Baby Buddy’s first round of antibiotics, he’s been fighting this thing off and on since Christmas as well. The doctor assures me that the antibiotics are working; I hope we see the results soon. Matt and I are finally finished with the sinus stuff (for now at least), but last week I was diagnosed with an eye infection that I’ve apparently been fostering since October. And now we’ve been struck with a stomach virus. It’s just been one thing after another for the last 6+ weeks. Nothing has been serious or life-threatening or resulted in hospitalization; it’s just the cumulative effect of illness in the house for an extended time. If you can’t find us next week we’ve left home to fumigate. Today I had a meltdown. One of those ugly cry, snot dripping down face, curl up in the fetal position kind of meltdowns. Fortunately, my best friend lives two doors down and came running to my rescue as soon as she answered my tear muffled call; otherwise, I might still be laying in the floor in a puddle of tears as the children screamed around me. It wasn’t pretty, but it was very, very real. This is how life feels right now. We’ve all been sick for a month. The baby is teething. I can’t stay on top of the chores like I feel I should. Life has caught up to me and is dragging me down. I am weary, to the bone and deep into my soul. I’m praying for reprieve. I’m praying for strength. This seems to be one of those times when God is forcing me to my knees and yet I’ve continued to fight it for too long now. I don’t know what I’m “chasing”, but it is running faster than I can and is obviously not the right thing. Please forgive me if you don’t see me here often. Please forgive me if I don’t make it by your place as often as I would like. It’s rough times and I’m trying to muster through. My light at the end of the tunnel right now is a scheduled retreat this weekend with several women I love and am honored to call my friends. The baby will come with me (Daddy would not be too happy if I left him at home since he won’t take a bottle! ), but I’m hopeful that a change of scenery and a change of routine will do my mind, my heart, and my body good. When we found out that Baby Buddy was joining our family I began researching double strollers. I went back and forth about what to get, how much we could spend, what features I wanted, etc. 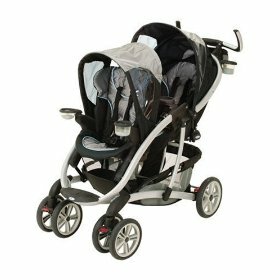 It finally came down to two strollers: the BabyTrend Sit and Stand Deluxe and the Graco Quattro Tour Duo. We went with the Sit and Stand because it was $150 compared to the $250 price tag on the Quattro. I really wanted the Quattro, though. I tried and tried to justify the additional $100 but just couldn’t. I convinced myself that it would be better to have the “stand” part of the Sit and Stand for Little and that for the price difference that this was the best option. I’ve used the Sit and Stand almost daily for the last 7 or 8 months, and while it a perfectly good and acceptable stroller, it’s just not exactly what I wanted. So imagine my surprise today when I saw on Baby Cheapskate that Angie had found the Quattro on Amazon for $99.99. I was so excited! I called Matt and asked if I could order one and then sell the Sit and Stand when the new stroller arrives; after a little pleading he agreed. I placed the order and now anxiously await my new stroller’s delivery on Tuesday. I hope it lives up to all of my stroller dreams and lasts us a good long time! Boo was given his bloggy name before we knew whether he would be a “he” or a “she”. Since his birth he has acquired many nicknames, none of which are “Boo”. Therefore, just to keep everyone on your toes, I’m going to make an official change to his online persona; he will henceforth, at least until I decide to change it again, be known as “Baby Buddy”. Little gave him this nickname and I think it’s hilarious. You are currently browsing the Sidetrack'd weblog archives for January 2009.